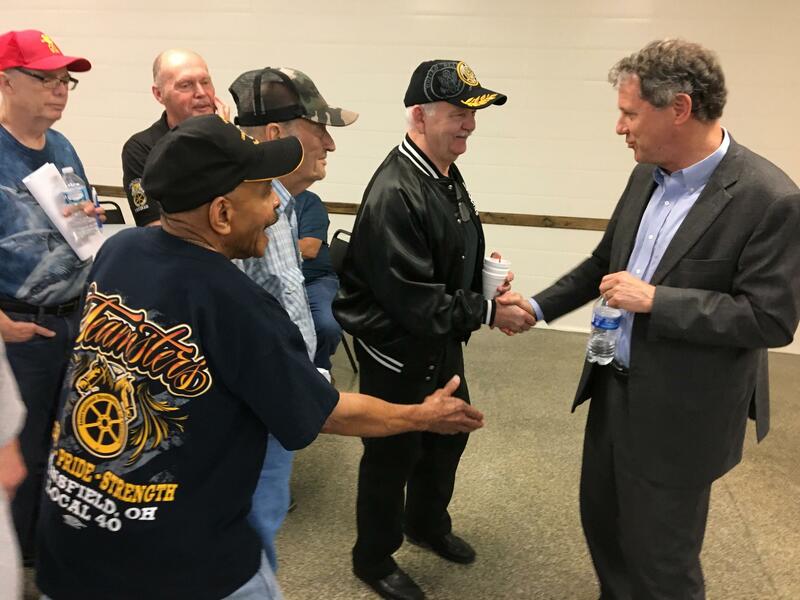 U.S. Sen. Sherrod Brown (D-Ohio) meets with teamsters in Ohio during before a forum. U.S. Senator Sherrod Brown (D-Ohio) is heading to New Hampshire to kickoff the second leg of his tour of the early presidential primary states. Brown says he's nearing a decision about whether to make a run for the White House. Sherrod Brown says like in Ohio, there are many Iowa communities dealing with the challenges of bad trade deals and globalization. And Brown says people are gravitating towards his “Dignity of Work” message. “I think that people everywhere have recognized that their work has not been rewarded the way it used to be -- that they’re working harder than ever,” Brown says, adding that a main sentiment from voters was that President Donald Trump has not delivered on his key promises to workers. In New Hampshire, he’ll hold forums on several topics, including paid family leave. The RNC has dismissed Brown’s tour as a “phony pro-workers’ agenda” that requires him to spend less time on his Ohio constituents. "Time and time again, Brown has sided with the far-left fringes of his party over a pro-workers' agenda - he voted against tax cuts, he votes against cutting regulations, and he votes against President Trump's agenda that has helped workers across the country," says Mandi Merritt, RNC spokesperson. Brown plans to decide whether he wants to run for president or not by March. In this week's episode of Snollygoster, Ohio's politics podcast from WOSU, hosts Mike Thompson and Steve Brown discuss how Sen. Sherrod Brown (D-Ohio) was received on his recent trip to Iowa. Clay Masters, political reporter for Iowa Public Radio, joins the show. Sen. Sherrod Brown wrapped up the first stop on his "Dignity of Work" listening tour in Iowa over the weekend, almost exactly one year before the state holds one of the first major contests of the 2020 presidential campaign. Ohio’s senior U.S. Senator has launched a tour of key presidential primary and caucus states, but says he hasn’t yet decided if he’ll seek the Democratic nomination in 2020. Three campaign experts in Ohio have thoughts on Sherrod Brown’s “Dignity of Work” tour. U.S. Sen. Sherrod Brown’s supporters gave him a send-off Wednesday night before his tour of early presidential primary and caucus states.